- " Invalid Page" message appears after logging to Community with a Community Builder page. This issue occurs when logging to the Community few times sequentially. - Blank page appears instead occasionally because of this issue. 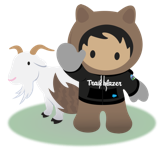 Add error handling to handle exceptions during the creation of the sample Visualforce components and apex classes, when creating a community/site. Contributors are unable to EDIT the Site in Site.com Studio due to redirection to the site dashboard. Renaming or Changing the Community force.com subdomain tends to results in "URL No Longer Exists" error message when accessing the new changed force.com community URL.